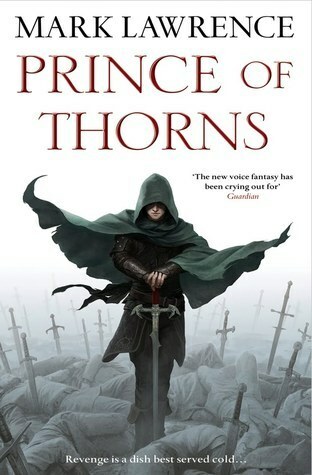 Just wrapped up reading Prince of Thorns by Mark Lawrence in a reading group I took part in on Mythic Scribes. I have to say, it’s one of the most unique fantasy books I’ve read in some time and Lawrence will be an author I keep my eye on going forward. I plan to finish out the series sooner rather than later. It’s also heartening news that the sequels are even better. This review may have mild SPOILERS, so be aware. First off, I felt Lawrence’s style was one of the strongest points of the book. It was engaging without be superfluous and the way the world unfolded without pages of info-dumping or exposition felt refreshing. I read lots of highly descriptive fantasy, so it was a nice change of pace for me. Not to say Lawrence’s style isn’t descriptive. It can be when it matters, which makes those parts stand out even more. When it comes to Jorg, I see him as the kind of character that people are going to have mixed feelings about. Some in my reading group found him to not be as engaging as a character due to his sociopathic tendencies. However, I found the distance I had from Jorg to be personally intriguing the same way peeking into the mind of Hannibal Lecter or the Joker might be intriguing. With shows like Breaking Bad being so popular nowadays, it is interesting to see a less conventional character in the lead. The story itself is well-done, showing Jorg grow as a leader and how he handles the snubbing from his father. He returns as the prodigal son, but is quickly swept under the rug as an afterthought. It slightly reminded me of the mother from Flowers in the Attic who tried to get rid of her children so she could start a new family and inherit a bunch of money. Jorg goes above and beyond though, and that’s when we get a glimpse into what this world really is. To say so would be a major spoiler, but I’ll just say this really isn’t your typical “epic” fantasy world. As far as the criticisms about it being incredibly dark, I just didn’t see enough of this to warrant that response. I read lots of darker fiction anyway, most notably horror in some cases, so the violence didn’t shock me. I’ve read books that are much more violent. I actually thought the book was darkly humorous in a lot of sections. The way Jorg interacts with his “brothers” can be quite funny. I’m interested to see how Jorg changes in the future books as well because it seems he’s evolving as events unfold. All that said, I think this is a strong debut with a unique voice I’d definitely like to see more of. I don’t like to give star ratings unless I’m forced to (read: Amazon), but I definitely give it a big thumbs up. If you’re looking for something atypical of the fantasy genre, you may enjoy Prince of Thorns.